Caltrans needs to stop focusing so much on moving cars and let cities build safer street designs with protected bike lanes, says a new report commissioned by Governor Jerry Brown and CA Transportation Secretary Brian Kelly. The report [PDF] calls out Caltrans’ “archaic” practices when it comes to imposing outdated, automobile-centric design standards on city streets in California, and says the department should reform its “culture of risk aversion and even fear,” which often prevents local city planners from implementing modern designs for bicycle- and pedestrian-friendly streets. When agencies like the SF Municipal Transportation Agency want to implement protected bike lanes, they must take a legal risk since Caltrans hasn’t approved such designs, and design exceptions require “a painful and time-consuming process,” says the report, produced by the State Smart Transportation Initiative. “The report recommends the direction come ‘from the top down and outside in,’ to avoid the long-standing status quo at Caltrans where bottom-up planning via staff just leads to ‘the culture endorsing itself,'” said TransForm. Stuart Cohen, TransForm’s executive director and a member of Secretary Kelly’s CA Transportation Infrastructure Priorities workgroup, said that “this is not the first report slamming Caltrans” but that the critical difference comes from the “tremendous leadership” of Governor Brown and Kelly, who commissioned the review. “We asked for an honest assessment because we are committed to modernizing Caltrans and improving transportation for all Californians,” Kelly said in a statement. “We have some internal reforms already underway so we can hit the ground running,” he said. “Most of the recommendations are not simple check-the-box action items, but calls for hard work of collaborating, rethinking and establishing a new course,” said SSTI reviewers. CalBike is backing Assemblymember Phil Ting’s AB 1193, “which would legalize and set design standards for cycletracks,” according to the Bay Guardian. The bill cleared the Assembly on Wednesday and next goes to the Senate. Caltrans should relinquish oversight of bike facilities on locally owned streets. Caltrans should generally rethink its approach to facilities in metro areas and town centers. Caltrans grew up with the idea it was moving travelers between cities, but now most of its facilities provide access between local destinations … The policies and standards in metro areas and towns should be very different than those for facilities in low-density rural areas; where the latter may legitimately focus on speed and throughput of motor vehicles (though not to the extent that they induce new travel and low-density development), the former should put pedestrian, bicyclist and livability concerns before auto-mobility. 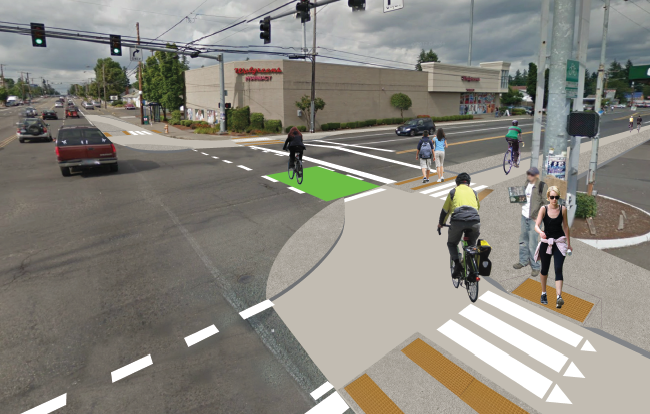 Narrower lanes, slower speeds, and pedestrian amenities should all be the default. Jerry Brown commissioned this report, so I hope he will act on it. However, so far his record on bicycling issues is a bit spotty. There hasn’t been appropriate prioritization of bicycling infrastructure in budgeting, and his baffling stance on give-me-3 came off very aloof. Aloof? That’s generous. I don’t think Aaron is quite fair to the California Highway Design Manual chapter 1000. It’s hardly pro-car, even if Caltrans clearly is. It’s guidelines for class III bike paths, for example a 40 kph to 50 kph design speed, seem to be widely ignored, since Caltrans doesn’t care about bike paths. My experience with SF’s separated bike lanes (an oxymoron under CHDM, but that’s okay) is mixed: they work only where cars don’t make right hand turns. On eastern Cesar Chavez, for example, every intersection feels like it could be my last, but on Alemany, they’re fine. I’m glad the experiments are happening, but the key really is to slow down the cars. I hope that this action eventually allows cities to assert complete streets needs over freeway access Level of (auto) Service. Today Caltrans trumps local authorities at freeway interchanges, leaving pedestrians and cyclists with poor facilities. One notable abomination is the Hamilton Ave / I-880 interchange (http://goo.gl/maps/4ALhF). Here eastbound cyclists on Hamilton need to position themselves in the center of 5 lanes because the rightmost two lanes become dedicated on-ramps to 880. If that weren’t bad enough the lanes are so narrow you need to ride in the center and take the lane. Once past the freeway interchange you pass a series of more dedicated right turn lanes meaning that cyclists are floating in the center of heavy traffic for nearly a half mile between Sylmar and Bascom. Campbell’s suggestion to cyclists: dismount and use the sidewalk. In other words there is no accommodation for cyclists for this half mile segment of Hamilton Ave, the only street that spans the Los Gatos Creek, I-880, and the railway for a distance of a mile and a half. Though I somehow doubt such designs will be even close to being considered until some community in California does a demo (perhaps à la the Berkshire cycletrack roundabout demo in the UK, which also currently does not consider such designs street-legal: http://www.bbc.co.uk/news/uk-england-london-22347184). I wonder what the provisions would be in any upcoming Caltrans guidelines allowing for at least the possibility of “experimental” (because apparently decades of success in the Netherlands don’t count because Not America) demos like this. Can we set up a demo in some large underutilized parking lot somewhere and show that it works? Yet California allows cars to park in bike lanes and protected bike lanes unless a “no parking” sign is posted.